Health and wellness are our goals at Directed Wellness Center on the Independence Square. Join us every 2nd and 4th Tuesday to learn how you can achieve improved health and wellness by increasing your general blood flow. 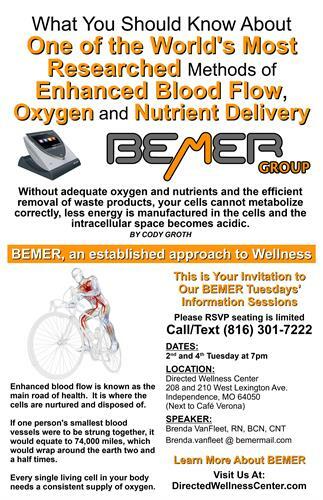 Come experience for yourself what increased bloodflow can do for you. Hear testimonials from others. "Feel Better, Think Better, Live Better"